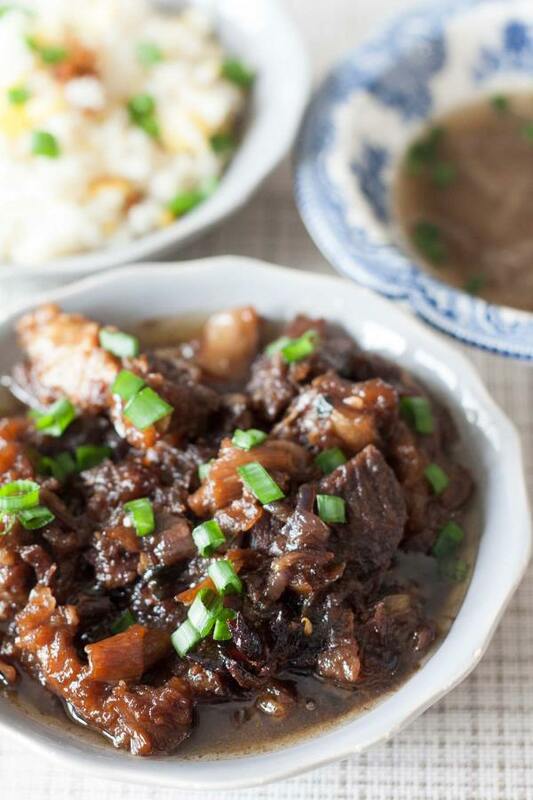 Beef Pares is a popular Filipino comfort food with Chinese influence. The use of star anise gives this dish a unique and delicious taste. Pares means pair or partner – a combination of beef and fried rice. Cuts with lots of litid (tendon) are used to achieve a texture that is tender and sticky at the same time. I usually use beef flank, but brisket and shanks are also ideal for making beef pares. MAKE THE BROTH. Place the beef in a pot and add water, making sure all the meat are submerged. Boil for about 10 minutes while skimming the scum that floats on top. When meat is no longer red discard the water, rinse the beef and the pot to remove all traces of scum. Replace the beef and cover with water once more. Add the garlic, onions, bay leaves, salt, and pepper. Bring to a boil again then lower heat, cover, and simmer for about 1 1/2 to 2 hours, or until meat are tender. Remove the meat from broth and keep the broth on low heat. MAKE THE BEEF. In a shallow pan over medium heat, heat 1 tablespoon of oil. Saute the onions, minced garlic and minced ginger. Add the cooked beef until lighltly browned, about 2-3 minutes. Add the beef broth, sugar, soy sauce and star anise. Stir until sugar is dissolved. Simmer the mixture until liquid has reduced, about 8-10 minutes. Taste and add salt and pepper as necessary. FOR THE FRIED RICE. Break cold rice to separate the grains. Heat the oil in a wide pan over medium heat. Add the minced garlic, stirring occasionally, until golden brown. Transfer the garlic bits on a plate lined with paper towels. Set aside. In a small bowl, beat 2 eggs and cook scrambled eggs on the same pan. Set aside. Add more oil into the pan, as necessary. Add the rice and separate the grains while spreading the rice on the surface of the pan until heated through. Add the garlic bits and scrambled egg. Mix and evenly distribute them into the rice. Season with salt and pepper to taste. ASSEMBLY. Get three bowls. Ladle broth into the first bowl, the beef on the second bowl, and the fried rice on the third bowl. Garnish each bowl with spring onions and serve with chili garlic with calamansi or lemon. 0 Response to "Filipino Beef Pares"